It’s not often that I’m wishing I were back in the New York specifically for the weather. But with the torrential downpours, tornado alerts and generally gloomy days, I’m missing the sunny skies and crisp spring temps I experienced a week ago. I loved having the opportunity to sport my favorite spring trench again before the heat returns to Texas. I think this coat will definitely come in handy while I’m abroad – it’s great as a lighter topper for daytime wear and makes all my outfits look effortlessly chic. I will likely need something a little heavier (or at least more rain-resistant) come September though. A few that I’m eyeing that look similar include this packable Burberry trench, this khaki North Face rain jacket, or even this Canada Goose hooded parka. If at any time you’d like help with locating a similar item from a retailer in your home country, let me know and I’ll do my best to find one for you! Classic perfection, and I love those perfectly fitting skinnys! That is a great idea to include a link to a retailer overseas where readers out of the country can shop your looks. I never really thought to do that. So fresh and so clean for spring :) You look amazing! That trench is going to be perfect for London! 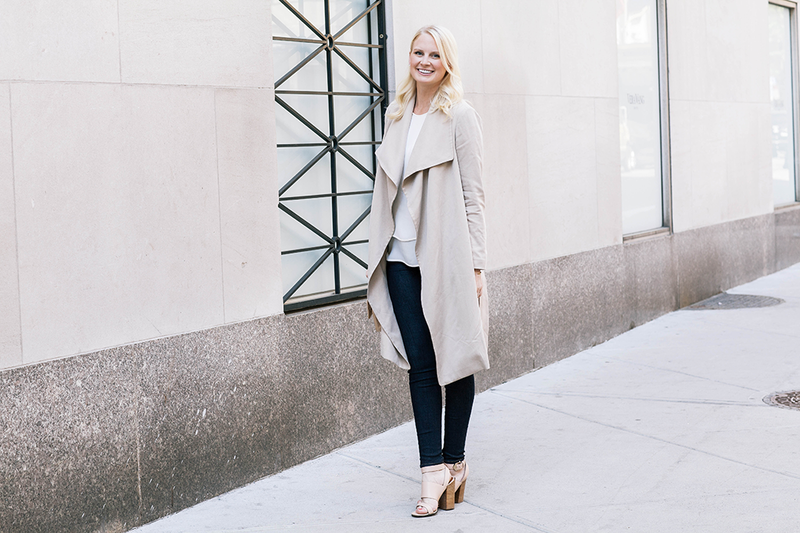 I love a light spring trench! Love that coat! Perfect color, weight and drape for Spring! I am on the hunt for the perfect spring trench like this. You look gorgeous! I am so excited. My husband and I are going to NYC for the first time ever next month. Loving this clean and chic spring look! That trench is the ideal wardrobe staple for transitional weather although if you were in NY this week, you’d be needing shorts and tees! The temps have been in the eighties the past few days. I’d defintely recommend visiting NY in the late spring and early fall…and avoid the winter at all costs! That trench is great! Those kinds of pieces are tough on a shortie like me but amazing on you! Such a gorgeous look! Love that trench and those sandals are perfect! I love that trench! Very cute! That coat is such a delight to look at. It’s so fabulous. I love it! Love the simple styling too! i am totally loving this gorgeous neutral outfit on you!! Love this drapey trench! Such a chic look. Love that trench coat and those jeans! Club Monaco can do no wrong. Great coat!